The C-1554 ... ultimate mobile solution. Positioned at the top end of Terex’s cone crusher range, the C-1554 is billed as the ultimate mobile solution for any aggregates producer or contractor looking for a high output capacity machine that provides large reduction ratios and an excellent cubical shape in the surface ore mining and aggregate industries. “This aggressive machine incorporates the proven Terex MVP450x cone crusher that can accept an all in feed and features direct variable speed clutch drive and hydraulic closed side setting (CSS) adjustment,” says a company spokesman. The Terex MVP450x pulverises everything that stands in the way of success. Inside and out, the advanced engineering of the MVP cone crusher sets industry benchmarks, featuring a patented Rollercone roller bearing design and the hydropneumatic tramp iron relief system that revolutionised the industry. 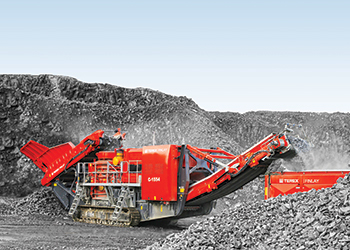 These features all combine to give operators an efficient and aggressive crushing action, high performance and low cost per tonne. “We knew that this new model would give be a game changer in terms of production capacity. The increased productivity, functionality and serviceability of the MVP450x chamber has consistently impressed operators of the machine during testing. The results have been outstanding and ultimately will deliver significant revenue streams and profitability for our customers,” says Alan Witherow, Terex Finlay’s product development manager. Additional benefits include rapid set-up time, ease of maintenance, high reduction ratio, advanced plant electronic control system, high output capacity and telemetry system.